As to often happens I run into a pistol I hadn’t really planned on buying. I was shopping for a pistol but not another 1911. Well if you read this blog much you know how much I love 1911’s! This Springfield is a bit rare. They were made in the early 90’s for a few years. This one was made in September 1993 according to Springfield. Why they discontinued such a handy pistol is beyond me. It has a Commander slide and an Officers size frame. With the new magazines out these days you don’t suffer any lose of ammo capacity since they now make seven rounders. This one came with only one magazine which from the follower indicates it’s a Metalform (rounded metal follower). I purchased a used like new Mc Cormick which was all the gunshop had and ordered a Kim-Pro mag with baseplate buffers of two sizes. One nice addition this pistol came with was a set of Trijicon night sights. 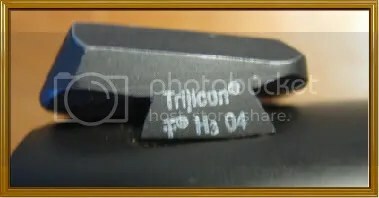 Something I like about the Trijicons is the front sight has a larger white ring around the Tritium vial. This is helpful in low light to make sure you don’t line the dots up wrong. When I bought it it had the thick rubber grips which some shooters like but I just don’t care for. Nothing wrong with them at all but we all have our preferences and I found these grips to be a bit to “tacky” and hang on clothing when you draw. 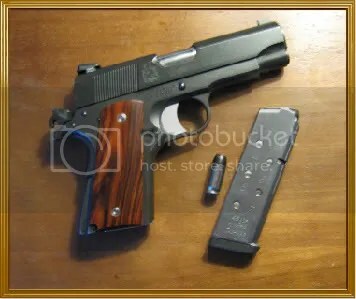 I ordered a set of McCormick Cocobolo thin grips which are sent with the shorter grip bushings and short grip screws. A nice touch that saves you some money by not having to buy the bushings and grip screws as extras. Mc Cormick makes high quality parts as well as grips and other accessories. The thumb safety was a type I hadn’t seen before. Narrow but very short surface area which makes it hard to use. I also ordered an STI extended thumb safety which I did have to do a small amount of fitting to operate smoothly. The pistol also had an early GI type short trigger. I prefer a longer trigger because of my hand size. I already had a longer trigger in my parts bin which required no fitting. Now I have this fine carry pistol just how I wanted it. 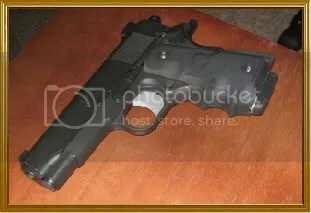 The frame is marked as being made by Imbel as are almost all Springfield Armory 1911’s. While some look on this decision with disdain I don’t. Imbel has made very high quality weapons and parts for gun makers all over the world and continue to do so. In fact they make one of the best Fn-Fal’s made. The finish is a taougher one to figure out. It’s not a blued finish nor is it parkerized. It appears to be an early hi tech finish. Very pleasing to look at and after all these years has held up very well since this pistol had no wear whatsoever. It hasn’t been used much anyway but as years go by any gun picks up little dings here and there. 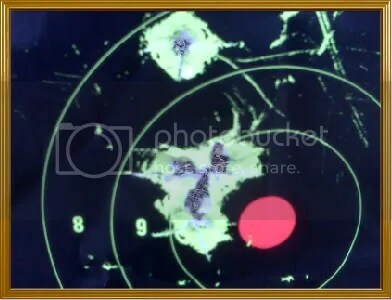 I set my targets and placed a Brirchwood Casey 5 inch stick on target in the center mass of the target. The results can be seen below. I fired one magazine of 8 rounds slow fire at 10 yards. All but one round made one hole about an 1 1/2 across. As you can see I did throw one round:-) It happens no excuses and my fault completly. Obviously the pistol is very accurate. 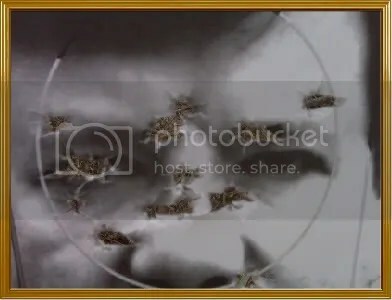 This second round was to the head of the target which has a 3 inch circle which can be seen in the outline. I fired two full magazines with the results shown in the picture. I did pickup the pace and fired a round about every second. The results turned out very good with all rounds within the 3 inch circle. That was the extent of the shooting for that day. It was about 14 deg and enough is enough! I shot to get an idea of how this pistol will perform and it did very well! This Springield Compact will make a very nice carry pistol. With the Officer frame the edge of the grip doesn’t show nearly as much under clothing as the full size frame and coupled with the Commander slide your sight radius is perfect for the distances a 1911 or any defensive pistol is used. This is the first one of these Springfields in this configuration I have seen since the early 1990’s and because production was fairly limited if you find one of these give it a second look. It will fill your defensive needs very well.